Proper data classification ensures the correct statistical tools are used to analyze baseline and final performance. Six Sigma projects can start out with the wrong baseline sigma scores or control charts as a result of improper data classification. The goal is not only selecting the correct data type but to collect data that provides the most information at the least expense. Theoretically has an infinite number of measurements depending on the resolution of the measurement system. There are no limits to the gaps between the measurements. It is data that can be expressed on an infinitely divisible scale. The continuous random variables can be any of the infinite number of values over a given interval. These variables generally represent things that are measured, NOT counted. Data types that have a finite number of measurements and are based on counts. Data that can be sorted into distinct, countable, and in completely separate categories. The count value can not be divided further on an infinite scale with meaning. Example: How many people can comfortably fit into an airplane? It doesn't make sense to say 129.7632213 people. It is either 129 or 130, in this case you would round down to 129. Attribute and discrete do not mean exactly the same when describing data, discrete has more than two outcomes. Used to represent the presence or lack of a certain characteristic. A binomial measurement has two characteristics. This is the lowest level of data type due to low level of information provided. An attribute data measurement systems analysis (MSA) compares how often each appraiser repeats his/her own answer each time analyzing the same unit/part and how often the answer matches an known or master answer (when one exists), and how often the appraiser response reproduces the other appraiser responses. The measures of central tendency are the mean, variance, and standard deviation. 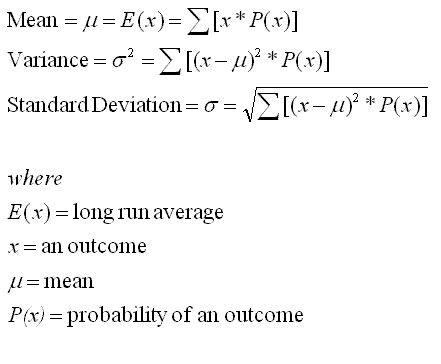 The mean is the expected value over a long run of occurrences. The standard deviation is simple the square root of the variance. The mean is the most commonly used measure of central tendency. It is the measurement used when analyzing a normal distribution of data. Data that uses concentration charts and answers the question “where”. Such as the concentrations of home foreclosures by regions in the United States. Continuous data is more precise than discrete data. Continuous data provides more informative than discrete data. Continuous data can remove estimation and rounding of measurements. Continuous data often more time consuming to obtain. Instead of a shipment being late or on time, it is better to know how late of how early the shipment arrived from the due date. It may be acceptable if shipments are within +/- 2 days, but the best score is given when shipments arrive at due date or +1 day. Recording YES/NO for on-time delivery will not provide the level of detail to make the best decisions. Instead of recording just the dollars or pieces scrapped, it is more valuable to know the scrap per unit or scrap per sales. If Plant A had molding scrap cost of $63,000/month and Plant B scraps $48,000/month, which performed better? With a denominator such as sales dollars a better conclusion can be made. If Plant A had $1,000,000 in sales in the same month, and Plant B had $50,000 in sales in the month, it is obvious that Plant B scrapped a much higher percentage of its product. The lowest level of data classification. A numerical label that represents a qualitative description. These numbers are labels or assignments of numbers that represent a category or classification. This is also referred to a categorical data usually of more than two categories and is a form of discrete data and should apply nonparametric test to analyze. The number assignment does not reflect that one category is better or worse than another. Other types of variables that often result in nominal data are religion, zip code numbers, birth dates, telephone numbers, federal tax ID number, ethnicity, and social security numbers. There limited statistical techniques to analyze this type of data, but chi-square statistic is most common. The average of the data or variance of the data is meaningless and values and quantitative descriptions are not appropriate. There is also no priority or rank based on these numbers. The next level higher of data classification than nominal data. Numerical data where number is assigned to represent a qualitative description similar to nominal data. These are measures by only the rank order. However, these numbers can be arranged to represent worst to best or vice-versa. Ordinal data is a form of discrete data and should apply non-parametric test to analyze. Master Black, Black Belt, Green Belt, Yellow Belt, etc. Nominal and ordinal data are from imprecise measurements and are referred to as non metric data, sometime referred to as qualitative data. The median or mode are measures of central tendency. Ordinal data is sorted into categories and the categories can be put in a logical order but the intervals between categories is not defined. Ordinal data is also round when ranking sports teams, ranking the best cities to live, most popular beaches, and survey questionnaires. The next higher level of data classification. Numerical data where the data can be arranged in a order and the differences between the values are meaningful but not necessarily a zero point. These are measures using equal intervals. Interval data can be both continuous and discrete. Zero degrees Fahrenheit does not mean it is the lowest point on the scale, it is just another point on the scale. The lowest appropriate level for the mean is interval data. Parametric AND nonparametric statistical techniques can be used to analyze interval data. Examples in temperature readings, percentage change in performance of machine, and dollar change in price of oil/gallon. Similar to interval data EXCEPT has a defined absolute zero point and is the highest level of data measurement. Ratio data can be both continuous and discrete. Ratio level data has the highest level of usage and can be analyzed in more ways than the other three types of data. Interval data and ratio data are considered metric data, also called quantitative data. Examples include time, income, volume, weight, voltage, height, pieces/hour, force, defects per million opportunities, resistance, watts, per capita income, items sold, years of education, and lumens.